The con­sul­ta­tion for an appro­pri­ate and Shāria com­pli­ant Moon­sight­ing sys­tem for near­ly 3 mil­lion British Mus­lims has tak­en a num­ber of years and exten­sive dis­cus­sions. The find­ings of these dis­cus­sions and research were pre­sent­ed to the Ula­ma at Majlis e Dawat­ul Haq (Leices­ter) on Sat­ur­day, the 9th of Sep­tem­ber 2017 where they were unan­i­mous­ly accept­ed by the Ulāmā. Shāykhul-Hādeeth (Maulana) Mohām­mad Ayub Bande Ilahi was the Ameer of the Mush­warā. These prin­ci­ples are based on years of research, expe­ri­ence, prin­ci­ples of Shāria and the prac­ti­cal need to unite British Mus­lims, par­tic­u­lar­ly on the occa­sions of Ramaḍān and Eidāin (i.e. the two Eids, Eidul-Fit’r and Eidul-Adhā). The Islam­ic Cal­en­dar referred to as the Ḥijrī Cal­en­dar is fol­lowed by Mus­lims across the world in order to ful­fil their reli­gious oblig­a­tions. The Ḥijrī Cal­en­dar con­sists of 12 Islāmic months. There are cer­tain months which car­ry more rel­e­vance due to the sig­nif­i­cant reli­gious acts which are per­formed dur­ing them; name­ly, Ramaḍān, Shawwāl, Dhū al-Hij­ja and Muḥar­ram. There are reli­gious acts with­in the remain­ing months as well. The start of Islāmic months is sub­ject to the (new) cres­cent. There is spe­cif­ic evi­dence in the sacred (Islāmic) texts for search­ing for the (new) cres­cent for spe­cif­ic months such as Ramaḍān, Shawwāl and Dhū al-Ḥij­ja, in order to com­mence acts of wor­ship. In the remain­ing months there is sec­ondary evi­dence of search­ing for the (new) cres­cent. In addi­tion, the sacred (Islāmic) texts call upon Mus­lims to search for (new) cres­cent on the 29th of each month. This require­ment dic­tates that a reli­able sys­tem for all 12 Islāmic months based on the cres­cent must be delib­er­at­ed, enact­ed and fol­lowed. The strongest posi­tion in nor­ma­tive Islām is for Mus­lims to sight the moon at their (respec­tive) loca­tion. There is active prac­tise of Moon­sight­ing in Britain and the moon is sight­ed in Unit­ed King­dom numer­ous times in a year. How­ev­er, the geo­graph­i­cal loca­tion of Britain and the British weath­er, does make sight­ing of the Moon dif­fi­cult. If British Mus­lims were to com­plete 30 days when the Moon is not sight­ed on the 29th day, there would be many con­sec­u­tive months of 30 days and we would find our­selves out of step with the rest of the Mus­lims. Although one of the opin­ions with­in the Hānā­fi Mad­hab states that dif­fer­ences of hori­zons are not to be con­sid­ered, a tru­ly glob­al Moon­sight­ing sys­tem is nei­ther (prac­ti­cal­ly) pos­si­ble nor advised in the Mad­hab. It is not pos­si­ble to string the world togeth­er into a sin­gu­lar Moon­sight­ing sys­tem from Auck­land (New Zealand) to Los Ange­les (Cal­i­for­nia). Thus, when the Mad­hab advo­cates dis­re­gard­ing dif­fer­ences of hori­zons, it is meant to be inter­pret­ed region­al­ly. We know that when we look at Moon­sight­ing curves, the sigh­ing is divid­ed region­al­ly. The only way to inter­pret the Moon­sight­ing sys­tem with­in the Hānā­fi Mad­hab is to inter­pret it region­al­ly. A tru­ly glob­al Moon­sight­ing sys­tem has nev­er exist­ed and nei­ther can it exist! 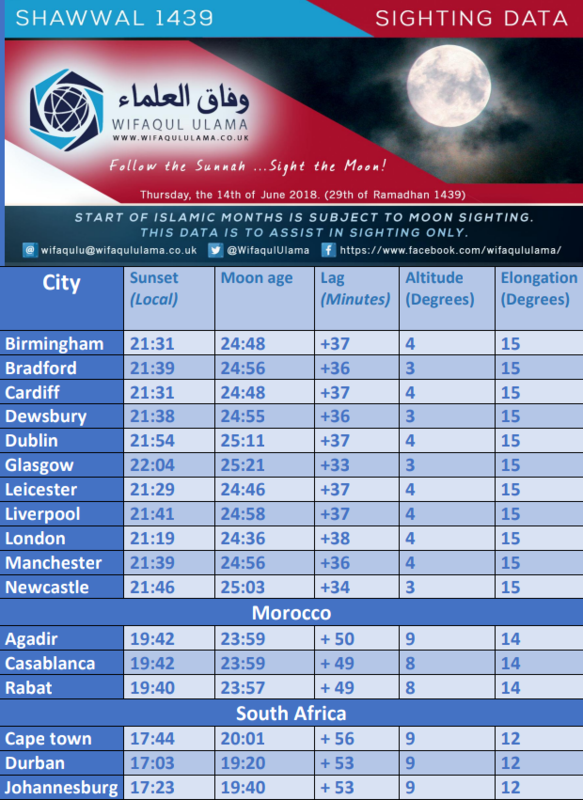 It is impos­si­ble for Mus­lims in Britain to wait for Moon­sight­ing in Hon­olu­lu which is 11 hours ahead. If the Mus­lims in Britain were to mere­ly accept Moon­sight­ing from the (East) it will lead to aban­don­ment of a nec­es­sary act (of Moon­sight­ing) from British Mus­lims. The com­mands of sight­ing the Moon and recita­tion of Duas (upon sight­ing the Moon) will become mean­ing­less for British Mus­lims. Thus local sight­ing in (Britain) must be organ­ised, planned and exe­cut­ed every sin­gle month of the Islam­ic Cal­en­dar as the pri­ma­ry method of estab­lish­ing Islam­ic months as per the Sun­nah. RED: Moon­set before sun­set, sight­ing should be reject­ed. AMBER (Less than Imkān al-Ru’ya): Moon­sight­ing claims should be thor­ough­ly scru­ti­nised and the num­bers of those claim­ing sight­ing and their exper­tise in Moon­sight­ing should also be checked. GREEN (Imkān al-Ru’ya): Moon age to be greater than 16 hours, lag­time to be greater than 30 min­utes (i.e. the moon sets more than 30 min­utes after sun­set) and elon­ga­tion to be greater than 10 degrees). Moon­sight­ing can be accept­ed. Here is the sight­ing cri­te­ria pro­duced for Shaww­al 1439 where all the nec­es­sary data is made avail­able. Once the sight­ing in a region is estab­lished, the tes­ti­mo­ny of the sight­ing must be con­veyed to a moon­sight­ing com­mit­tee in a com­pli­ant man­ner. In order to ful­fil this require­ment, we have reached bilat­er­al agree­ments with var­i­ous oth­er moon­sight­ing com­mit­tees in Britain and abroad. The key agree­ments are between Wifāqul Ulāmā , Bat­ley Moon­sight­ing com­mit­tee and Rochdale Coun­cil of Mosques (RCM), due to these bilat­er­al agree­ments they can share moon­sight­ing tes­ti­monies with each oth­er. L’Observatoire Lunaire des Musul­mans de France (OLMF) attempts to sight the cres­cent month­ly and has an agree­ment in place with Wifāqul Ulāmā. Note: Some of the word­ings of this agree­ment is under review and may change in the future. British Mus­lims have been work­ing with author­i­ties of Moroc­co and accept­ing moon­sight­ing since the 1960s. Some of the British organ­i­sa­tions such as Rochdale coun­cil of Mosques , BMSC (Bat­ley Moon­sight­ing Com­mit­tee) , Wifāqul Ulāmā , British Mus­lim Forum and ICO-UK have agree­ments with and receive fax­es from Min­istry of Endow­ment and Islam­ic Affairs (King­dom of Moroc­co). Some of these organ­i­sa­tions receive fax­es (from Moroc­co) while oth­ers infor­mal­ly con­sult and coop­er­ate with each oth­er. Moroc­co is divid­ed into 16 admin­is­tra­tive regions and has over 278+ sight­ing points. Attempts to sight the moon are made every month and each of the 278+ sight­ing points sends a report (month­ly), which is then reviewed by two judges before being for­ward­ed cen­tral­ly to Min­istry of Endow­ment and Islam­ic Affairs (King­dom of Moroc­co), where the final deci­sion is made. This entire process is repeat­ed month­ly. British Mus­lims have been using and rely­ing on moon­sight­ing from Moroc­co for over 4 decades in one capac­i­ty or anoth­er and there has nev­er been an error or claims of sight­ing con­tra­dict­ing astro­nom­i­cal cal­cu­la­tions. Since a group of from BMSC (Bat­ley Moon­sight­ing Com­mit­tee) vis­it­ed Min­istry of Endow­ment and Islam­ic Affairs (King­dom of Moroc­co) and cre­at­ed a bilat­er­al agree­ment, Wifāqul Ulāmā is also cov­ered. It is due to lack of time dif­fer­ence and lat­er sun­set (times), delay is expe­ri­enced in the news of actu­al sight­ing reach­ing British Mus­lims. Dur­ing win­ter months due to South African Stan­dard Time (SAST) being UTC+2, once the Moon sigh­ing has been exhaust­ed after sun­set in Britain, the news from South Africa can be received rel­a­tive­ly quick­ly. The arc of vis­i­bil­i­ty is sim­i­lar for Britain, Moroc­co and South Africa. Mus­lims of South Africa also have a robust (month­ly) moon­sight­ing sys­tem and British Mus­lims have been using and rely­ing on moon­sight­ing from South Africa for near­ly 2 decades. Malawi is part of Africa and also has a robust and reli­able month­ly moon­sight­ing sys­tem. Wifāqul Ulāmā has now signed a bilat­er­al moon­sight­ing agree­ment with Malawi. Zam­bia is part of Africa and also has a robust and reli­able month­ly moon­sight­ing sys­tem. Zam­bia Nation­al Hilaal Com­mit­tee has been oper­at­ing under the aus­pices of one of the longest serv­ing Mus­lim organ­i­sa­tions in Zam­bia, Lusa­ka Mus­lim Soci­ety (L.M.S. est. 1957). British Ula­ma have repeat­ed­ly vis­it­ed and inves­ti­gate their month­ly moon­sight­ing sys­tem. Wifāqul Ulāmā has now signed a bilat­er­al moon­sight­ing agree­ment with Zam­bia. Zim­bab­we is part of Africa and also has a robust and reli­able month­ly moon­sight­ing sys­tem. Wifāqul Ulāmā has now signed a bilat­er­al moon­sight­ing agree­ment with Zim­bab­we. Mozam­bique is part of Africa and also has a robust and reli­able month­ly moon­sight­ing sys­tem. Wifāqul Ulāmā has now signed a bilat­er­al moon­sight­ing agree­ment with Mozam­bique. Réu­nion is locat­ed in the Indi­an Ocean and has a robust and reli­able month­ly moon­sight­ing sys­tem. It’s unique (geo­graph­i­cal) loca­tion and clear weath­er, enables it a unique oppor­tu­ni­ty to sight the Moon. British Ula­ma have vis­it­ed and inves­ti­gat­ed their month­ly moon­sight­ing sys­tem. BMSC (Bat­ley Moon­sight­ing Com­mit­tee) have test­ed and ver­i­fied their sight­ing for close to a decade. Wifāqul Ulāmā has now signed a bilat­er­al moon­sight­ing agree­ment with Réu­nion. This is out­side of Africa and it is extreme­ly unlike­ly that Moon will be seen in Réu­nion but not any­where else in Africa, such an event has not occurred in 40+ years. There are two coun­tries which effec­tive­ly coor­di­nate moon­sight­ing with­in Amer­i­c­as. Pana­ma and Amer­i­ca coor­di­nate and coop­er­ate pri­mar­i­ly while the oth­er coun­tries in Latin, South, Cen­tral and North Amer­i­ca fol­low their guid­ance. Due to time dif­fer­ences it may not be pos­si­ble for British Mus­lims to utilise the moon­sight­ing news and tes­ti­monies from these coun­tries. Nev­er­the­less, Wifāqul Ulāmā has signed a bilat­er­al moon­sight­ing agree­ment with Pana­ma and Amer­i­ca for acknowl­edg­ment and shar­ing of infor­ma­tion. Islami­tisch Obser­va­to­ri­um Ned­er­land in Hol­land has been con­duct­ing month­ly Moon­sight­ing for some time. Wifāqul Ulāmā is cur­rent­ly dis­cusss­ing the need for a bilat­er­al moon­sight­ing agree­ment with them and sight­ing will be accept­ed based on agreed prin­ci­ples, once the agree­ment has been con­clud­ed. Nige­ria is part of Africa and tra­di­tion­al­ly did not have a robust month­ly moon­sight­ing sys­tem. We have been assured that improve­ments have been made and the Moon is now sight­ed month­ly. Wifāqul Ulāmā is cur­rent­ly dis­cusss­ing the need for a bilat­er­al moon­sight­ing agree­ment with them and sight­ing will be accept­ed based on agreed prin­ci­ples, once the agree­ment has been con­clud­ed. Con­tin­ue to use the cur­rent sys­tem of observ­ing the Moon in Britain and then tak­ing tes­ti­mo­ny from Moroc­co and South Africa. Observe the Moon in Britain and then take tes­ti­mo­ny from Moroc­co, South Africa and any of the coun­tries with a bilat­er­al agree­ment in situ. This is to facil­i­tate uni­ty amongst British Mus­lims. 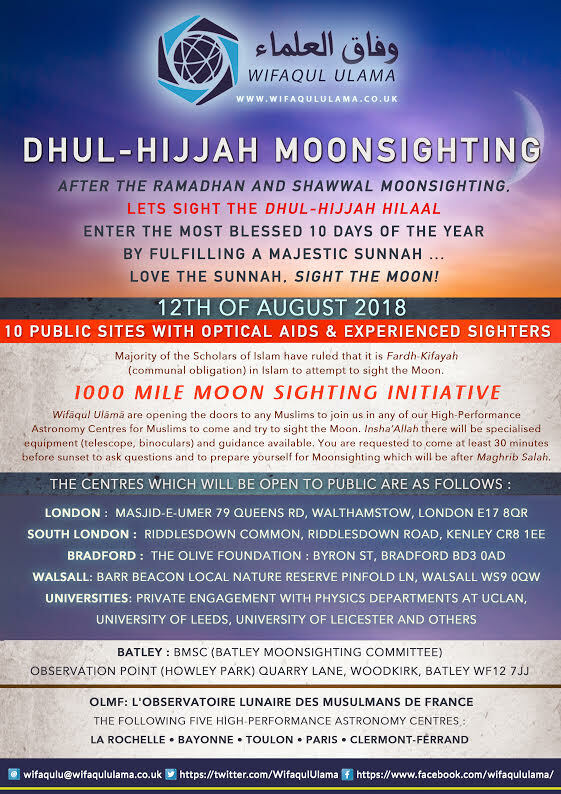 The rea­son to extend the (British) hori­zon and opt­ing to take moon­sight­ing tes­ti­monies is due to the well-known Hadith. Nabi (Sal­lal­la­ho Alai­he Was­sal­lam) com­mand­ed us to observe fast when the moon is sight­ed and to (con­clude the month of) fast­ing when the moon is sight­ed. This nar­ra­tion is Mut­laq (uncon­di­tion­al) and as long as the actu­al sight­ing can be ver­i­fied, con­firmed and reli­ably trans­mit­ted (the body of) Mus­lims can begin their Ramaḍān and con­clude it (thus begin­ning Shawwāl). Sayyid­i­na Abu Huraira (RA) nar­rat­ed that the Mes­sen­ger of Allah (Sal­lal­la­ho Alai­he Was­sal­lam) made a men­tion of the new moon and (in this con­nec­tion) said: Observe fast when you see it (the new moon) and break fast when you see it (the new moon of Shaww­al), but when (the actu­al posi­tion of the month is) con­cealed from you (on account of cloudy sky), then count thir­ty days. [Mus­lim]. Dif­fer­ences of hori­zons are to be con­sid­ered, i.e. each loca­tion must have its own (local) dis­tinct and sep­a­rate moon­sight­ing. Dif­fer­ences of hori­zons are not to be con­sid­ered. Adopt­ing the sec­ond opin­ion, gives us room to pro­mote the uni­ty and cohe­sion of British Mus­lims in cel­e­brat­ing Eidul-Adhā.